Now we might not always be particularly “gourmet” when it comes to food (we genuinely love Sonic and Chick-fil-A… Shame! *bing* Shame! *bing*), but there is one place where we turn from ‘people who eat sausages and mashed potatoes on the couch while watching stupid TV shows’ to ‘people who dress up and look smug while savoring artfully prepared dishes’. This place is the Wright’s at Biltmore Hotel in Scottsdale, or as we call it, “The Fancy Brunch”. The concept at this brunch is a bit different from a regular “all you can eat” buffet. They do have a buffet, a magnificent one if I may say so, but you also have 5 small entrées you can order and have prepared freshly for you. First about the buffet: it features homemade pastries, like croissants, pain au chocolate, bagels, muffins and cakes. Then you can load your plate with absolutely fresh seafood, always available are shrimp, cold smoked salmon and crab claws, and depending on the availability, mussles or oysters, all of which can be drowned in the by far most delicious cocktail sauce I have ever encountered! My favorite part of the buffet is the cheese selection, especially one cheese that just tastes so good on slices of extra crispy bread. I would come to Wright’s just for that damn delicious cheese! People without an obsession for fermented dairy products can dig into a selection of deli meats, salads, fruit, vegetables, yogurt, granola, and tiny plates of prepared cold dishes like caprese salad made with colorful heirloom tomatoes, or tiny lamb chops on crisp vegetables. They always offer an egg Benedict, pancakes, waffles, one meat and one seafood dish. The entrées change every week. We went there six or seven times now and the eggs Benedict were always the absolute BEST of all entrées. Jesus Sodapop Christ, I could just go back right now and eat ten more of them! We had them on top of braised short rib with toasted brioche, we had them on crispy pancetta with wilted spinach, and today we had them on smoked bacon and roasted summer squash with a green chili hollandaise. As always the egg was poached perfectly. When that liquid yolk is pouring out when you cut it, that must be how it feels to hold your firstborn. Probably even better. 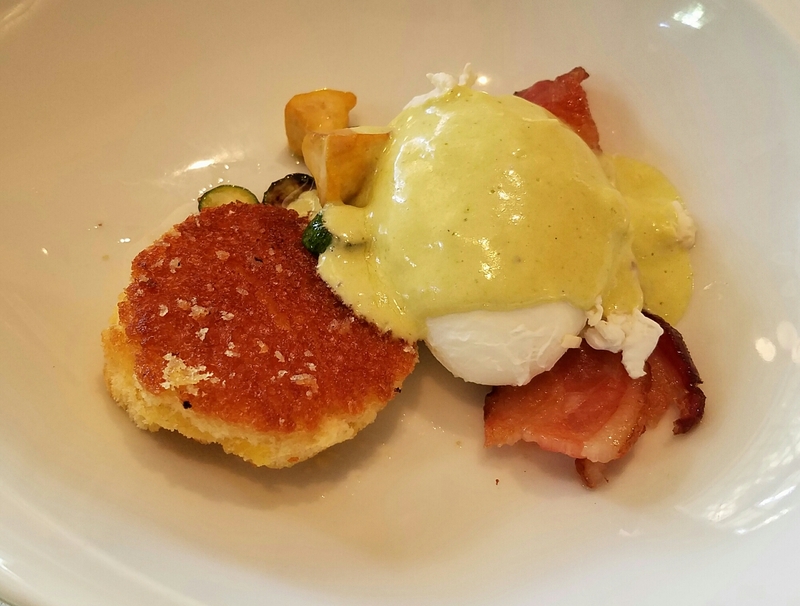 What do I know, I don’t have kids yet, but I had the most damn perfect egg Benedict! I win! The second, also always perfectly executed dish, was waffles. I swear to you, you won’t get a better waffle anywhere. It’s really crispy on the outside but fluffy on the inside, and the toppings are always on point. My all time favorite so far (and the only reason why I wished the dishes wouldn’t change every week so I could have it again) were rosemary waffles with a whipped goat cheese butter on top. Now I think goat cheese tastes like goat poop smells but THIS, this was just the perfect amount of that ferocious goat taste combined with the herbal rosemary aroma, cut by a sweet drizzle of maple syrup. 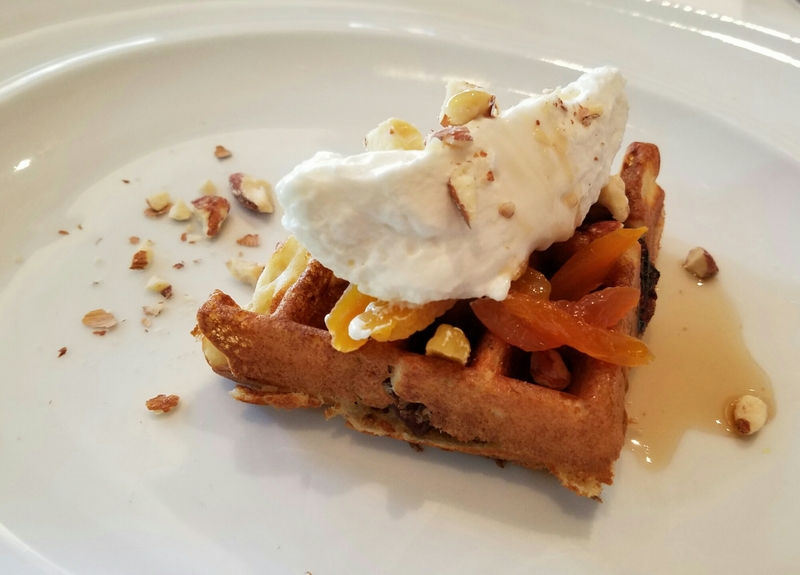 Today’s waffles were made with chopped dates and topped with dried apricots and Chantilly cream. I ordered two of them because they were out of this world. Doesn’t that already look like prepared by the gentle hands and the mastermind of a cook who sold his soul to the devil for the secret to perfect waffles? It definitely tastes so! Today’s third dish was pancakes. Now I tend to omit on the pancakes which is not due to them being any less than amazing but because they are a generous portion and I can’t fill my tiny stomach with pancakes when there are five portions of damn delicious cheese on crispy bread to eat! The meat entrées are mostly beef, often it is a creative twist on steak and eggs, but we also had fancy gourmet moments with melt-in-your-mouth cheeks or extremely flavorful ox tail, paired with different roasted vegetables and sides like herb spaetzle or purple potatoes. You see, you are not getting cookie cutter fancy food here, you’re getting the fancy fancy food! 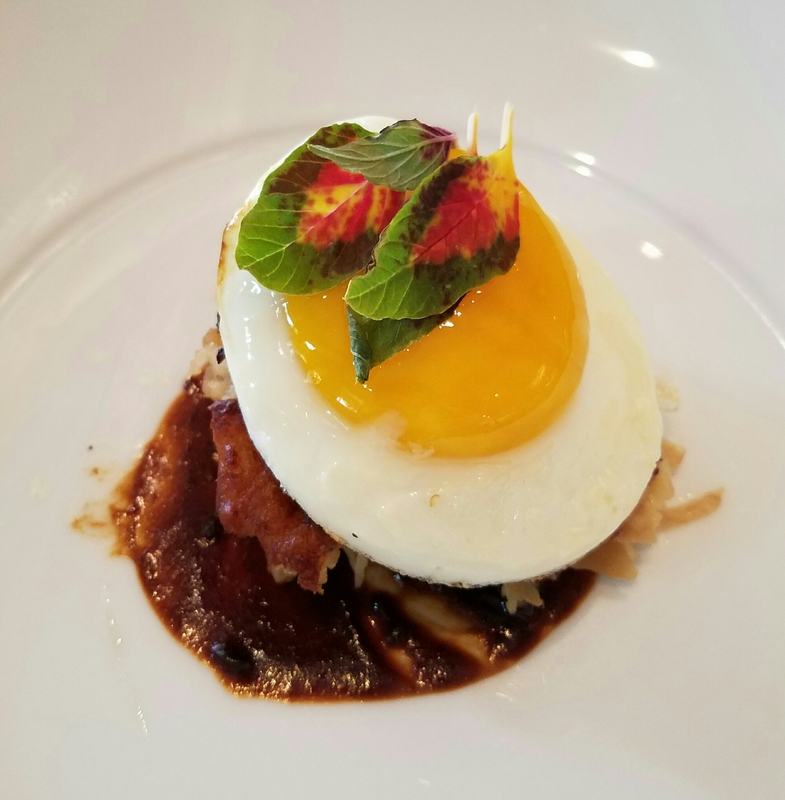 Today’s beef dish: steak and a sunny side up egg on a pan fried potato onion cake and ancho chili sauce. My highlight of the dish was the potato onion cake which reminded me so much of the German crispy potato cakes, called Reibekuchen or Datschi, that we eat with apple sauce and cinnamon sugar. But the sauce didn’t disappointed either, I wish I could buy it in a bottle. A very very big bottle. I think I don’t even have to mention that the steak was cooked as good as it can possibly be cooked. Probably prepared by the same cook who sold his soul to good ol’ goat foot Satan. The seafood dish of today, last on today’s entrée list, was not the very best I ever had, but previous ones still make my heart sing and my stomach growl when I think about them. Think crusty crab cakes, gorgeous marinated shrimp, perfectly flaky fish, on genius concoctions like sweet corn puree or zesty white bean salad. 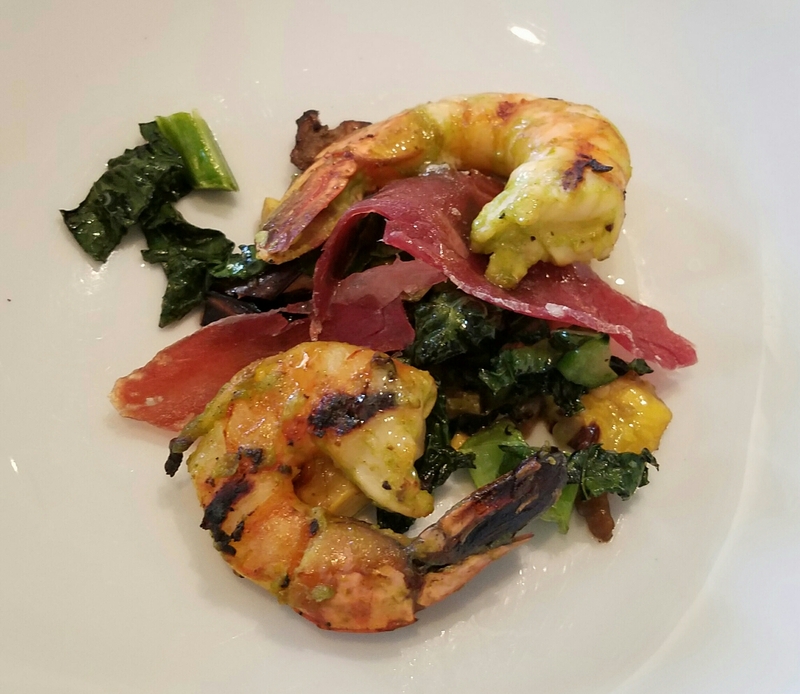 The shrimp today were citrus marinated and came on a bed of roasted vegetables with prosciutto and lemon butter. The vegetables featured eggplant, my vegetable nemesis, and the prosciutto made it a tad too salty for my taste. 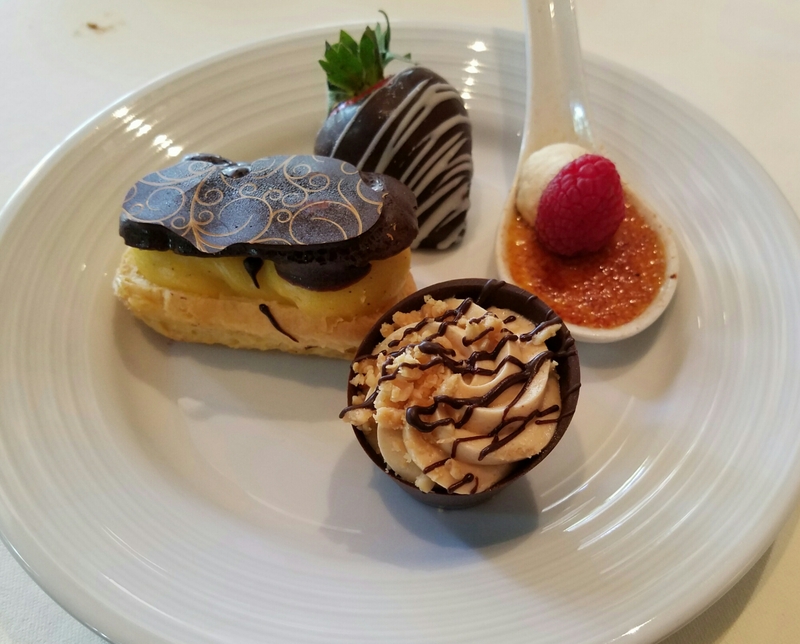 Of course, no meal is complete without a dessert and, surprise, there is another buffet here that is just desserts! Think cheesecake! Think mousse! Think pudding! Think everything you could wish for! Please ignore the spot on the tablecloth, when I found the eggplant piece in my dish I accidentally flicked it off the plate in my “avoid any contact with this demonic vegetable from hell” panic. My first round of dessert (yes, first, did you really think I’d have just one plate of dessert? Hahaha…!) 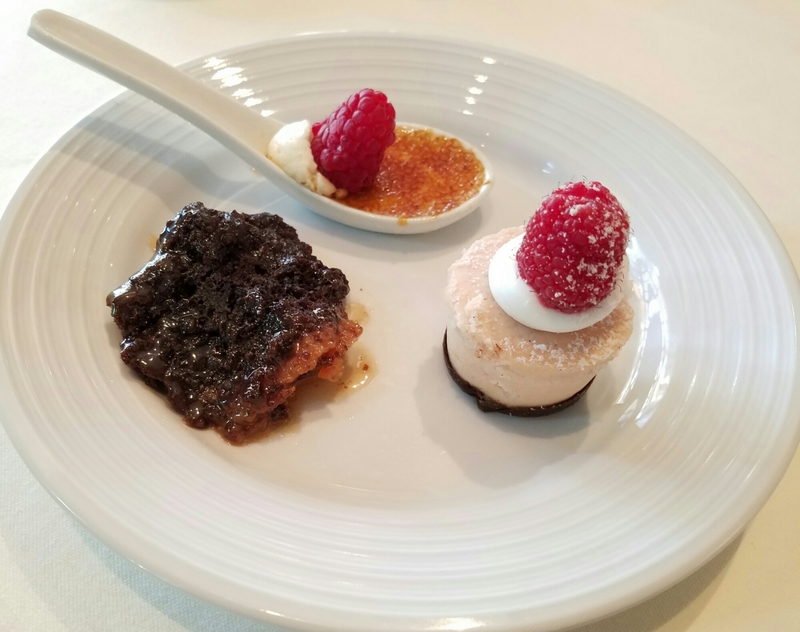 was a wonderful eclair, a chocolate covered strawberry, creme brulée on one of those upscale spoons (when you get food on these spoons you know those people ain’t playing, they’re noble! ), and peanut butter mousse (it was so silky! I want to cry! Tears of joy!). Second round of dessert: yet another creme brulée noble spoon (next time I’ll get one plate just with that creme brulée! I think I can fit ten spoons on a plate. Wanna bet? ), raspberry cheesecake and warm (!) chocolate caramel bread pudding which was so incredibly rich and sweet, I have no words. 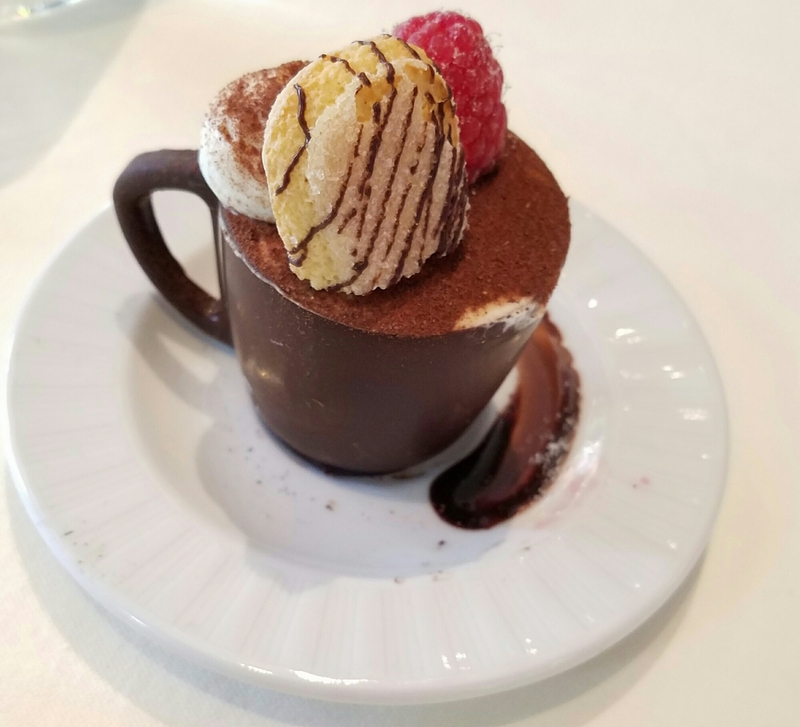 A joy for the eye and the tastebuds was also this tiramisu in a cup made entirely out of chocolate! You see, we definitely did pig out, as we always do there. Of course always keeping it classy though! Let me mention this: not every single dish we ever had there was mindblowing. I remember the Christmas special of candy cane pancakes that still makes me cringe (candy canes, urgh…) or a fish dish that had a bean relish we both did not enjoy all too much, or a delicious looking tiny cheesecake that tasted like marzipan (marzipan! Why me?). The execution is always flawless, but personal taste can’t always be met to the point. Overall the brunch offers enough for everyone though! The whole atmosphere is by the way more relaxed than you might expect with all that elaborate food. There is an elderly gentleman who plays the piano so beautifully that I sometimes just stop and listen until I hear a “hrm hrm” from a fellow patron because I’m blocking the access to the wedge salad. The attire of the guests is also less than formal as the restaurant is in a hotel, so you will have some guests in shorts and shirt with their hair still wet from the pool amongst people in dress shirt and suit pants. A few words about the service: coffee, tea, juices and water are included in the price and the waiters are mostly very attentive, refilling your drinks, taking away emptied plates immediately, bringing out new cutlery, all with lots of “you’re welcome sir” and “my pleasure Miss!” and one hand behind the back. There’s a rotten egg in every basket but we were lucky enough to have had the best waiters every time except one time. Today we found out that you can request a certain waiter so next time we go there we will enjoy the top service of the top waiter again. Now with all the praise and hooray you might think I got paid for this review, but rest assure, as much as I wish I was, my opinion is honest and true (as it would still be if I would get paid). 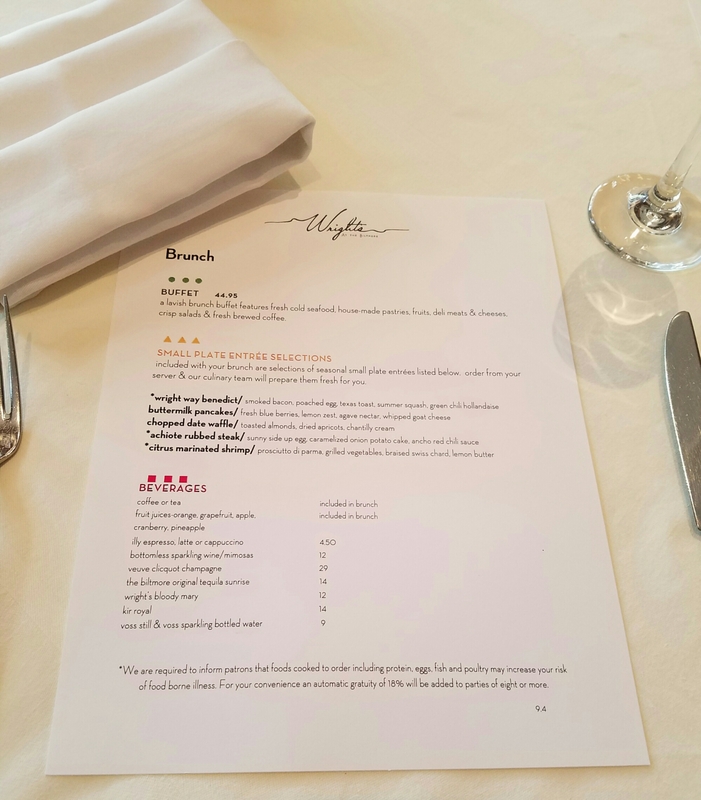 If you should ever get the chance to visit Wright’s at the Biltmore in Scottsdale, please do so on a Sunday between 10am and 2pm to enjoy this magnificent brunch! Song of the day: Stevie Wonder – Isn’t she lovely as the piano player entertained us with a wonderful version of it.